There are a lot of factors which can affect your work potentials such as technology, stress, ego clashes, health, perceived discrimination, and The Boss. Getting to know the type of your Boss you have is an important step towards having a professional relationship with them. After all, your Boss can dictate whether your stay with the company will be in favor of the organization or not. He/She is the one who decides to keep you or to kick you out. 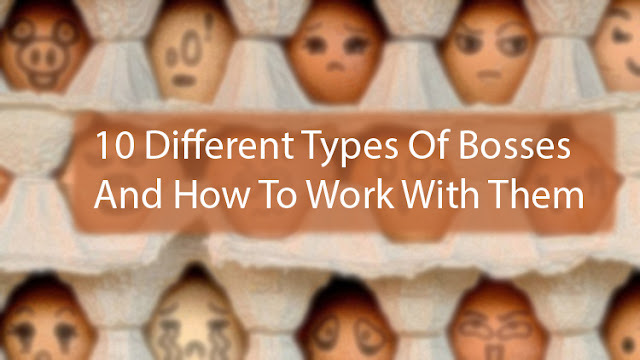 Here are 10 different types bosses and how you can relate to them. The workaholic is a boss who tends to work overtime, even during holidays. They are typically extremely enthused about completing undertakings on time and will recommend additional work hours keeping in mind the end goal to accomplish this. The vast majority of them barely go on sick days or take leaves from office. Working under a workaholic can be stressful, especially if you’re not one. There’s a high chance it will greatly impact on your work-life balance. If you want to get yourself promoted in this sort of environment, make sure you complete your work on time. They will have no reason to hold you back for more work. Visionary bosses tend to dream a lot about the company’s potential, and the future. They have a lot of ideas about which direction the company can take but usually lack the initiation capability. In order for you to charm yourself to a visionary boss, always attempt to enable them to accomplish their ambitions. Make a contribution to help them understand their goals and follow it up on a regular basis. If everything works fine, they will have you to thank and you might get a promotion for it. Micromanagers are dreaded in any workplace. Most bosses tend to become micro managers whenever the company is making losses. They will start concentrating on every single action you make, be it work or non-work related. They might concentrate on things like how long you took during lunch, what amount of work you’ve been able to deliver in a day or how much time you’ve spent on the phone. If you have this type of boss, the solution that will work for you is to keep them busy. The only way to achieve this is by making sure you complete your tasks in time. They will have so much work to review that they will forget about micromanaging. Pace-setter bosses like to test their employees by giving them constant tasks in order to find how good they are. They might give you challenging tasks to accomplish within a specific time frame while expecting the best results from you. They always expect you to be fast and better each time. You will have to work hard under a pace-setter boss to stay their good books. This boss is one who is less taught than you or knows minimal about the organization and its procedures. They will rely on you to provide information they might not be aware of. But never underestimate their power because a boss is always a boss even if you leave him behind in education. Have a close relationship with them and explain them everything they need to know. Once they get up to speed with everything, they will have you to thank. This type of boss squeeze every last ounce of talent from the employee. They know what each employee is capable of and tend to be the best to work with. They will give you work according to your talent which will boost your resume. The problem with this kind of bosses is that they might insist on you to work overtime and even on off days. Even though your career might take off, your life work balance will be greatly impacted. Unfortunately, there’s little you can do with this type of a boss. Your only options are to ask for a pay rise for your extra input or to find an alternative job. These bosses are often called dictators also. They fall back on terrorizing strategies, for example, hollering, when speaking with their employees. They will chide you on the off chance that you neglect to perform in an agreeable way. A good way of dealing with such a boss is by making sure you do your job. Never give them a single chance to yell at you. Speak with them about the work you're doing if needed, yet don't capitulate to their terrorizing strategies. They will appreciate you for this. 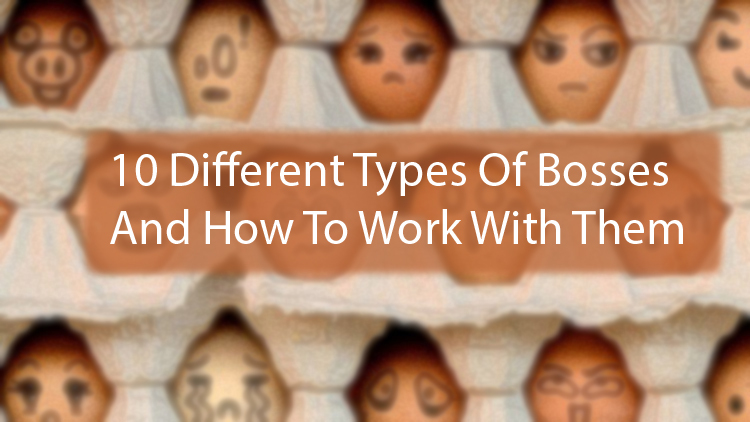 If you have an unpredictable boss, then there’s not much that you can do. These bosses’ actions are hard to predict. Whereas they may be satisfied with something today, the same may not necessarily be true tomorrow. This means that you’ll always have to break into a sweat whenever you’re reporting to them. The only way you can try and alleviate their “unpredictability” is by ensuring that you do your work as expected. These supervisors tend to stick to old organization customs, and they may bring this up during meetings. They have most likely been in the organization for quite a while and they don't warmly welcome change. Never try arguing with a traditionalist, and always be responsive to their thoughts. You never know, some of their old strategies may really work. If there is an easier way of doing something, bring it to their attention in a kind way. They don't prefer to feel challenged. They'll get more open to your thoughts once they feel you're responsive to theirs. A perfect boss treats the employees in the workplace fairly. They are open to suggestions and are willing to give you space to do your work. They will exhort you on your vocation prospects and may enable you to accomplish your professional objectives. Moreover, their work relationship does not end in the workplace. They are constantly prepared to catch up with you on your most loved group's diversion after work hours. Unfortunately enough, the world does not have the same number of ideal bosses as everybody would wish. On the off chance that you have a perfect boss, value their endeavors! They will leave an enormous void once they leave the organization.